Grinding beans every time you want fresh espresso takes time, and oftentimes it becomes a tradeoff between taste and convenience. The Breville Barista Express solves this problem, delivering fresh, quality espresso at remarkable speed, thanks to its integrated burr grinder. Go from beans to espresso in under a minute-all in the comfort of your own home. Even complete beginners and aspiring baristas can pull a perfect shot with the Breville Barista Express. For beginners, it comes with two dual-wall, pressurized filters that regulate pressure and help optimize the extraction. For more experienced baristas, the Barista Express includes two single-wall, non-pressurized filters that give you more room to experiment with different grind sizes, grind amounts, and tamping pressure. 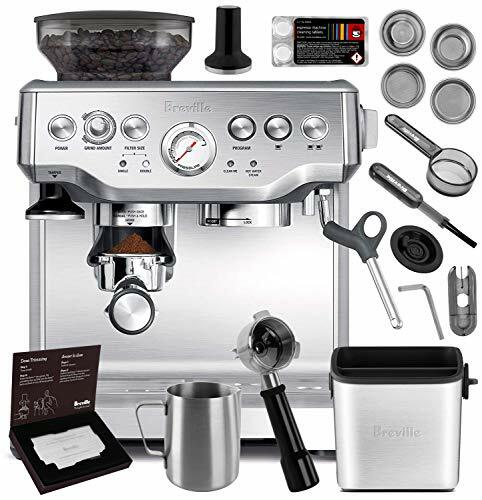 The Breville Barista Express has an Italian-manufactured 15 bar pump and thermocoil heating system that ensures accurate regulation of water temperature for a full-flavored espresso. A pre-brew function and flat shower head make sure that the water is optimally distributed through the coffee puck. The Barista Express also has several helpful features, such as a cup warmer on the top of the machine and a feature that removes excess water from the filter basket after coffee extraction, so the used grounds form a dry puck for quicker cleanup. Lastly, it has a stainless steel 360 degree swivel-action steam wand for lattes and cappuccinos. No-slip feet keep the machine from sliding across the counter when the burr grinder is activated. The Barista Express is housed in a sleek stainless steel casing, making it an attractive and timeless addition to any kitchen. The entire unit is easy to clean and comes with a hideaway storage compartment for the included cleaning tools, in addition to an easily removable drip tray.